← Springfield Jobs – Act One Calendar and Numbers to Get It All! Just popping in with a quick note. I’m seeing more and more comments come across about your game freezing when you unlock the Fine Arts Museum (first prize of Act 1) in Springfield. A couple of tips to try first…..
-Make sure you have enough land open to place the museum in Springfield. When you unlock it it’s searching for a plot of land to be placed on, if you don’t have one available the search won’t stop. -Wait when you unlock it. The game may seem frozen but give 30 seconds to a minute (in some cases longer). My game appeared frozen for about 30 seconds but then it allowed me to place it. -If it is, in fact, frozen, try a hard close and restart and wait again. If those steps don’t help Contact EA. Thanks guys! Hope those tips help out! This entry was posted in Glitches, Tips and Tricks, Troubleshooting and tagged Fine Arts Museum Freezing, Springfield Job Event, Springfield Job Event Freezing, Tapped Out Tips and Tricks, The Simpsons Tapped Out, TSTO Addicts, TSTO Freezes when placing prize, TSTO Springfield Job, TSTO Springfield Job update, TSTO Tips and Tricks. Bookmark the permalink. xaris4711 – in continuation to my previous post on this thread 5 days ago.. It seems that there are two kinds of freezes. The first kind is happening every single time someone opens the game. The pop up message appears about awarding the Museum and may/can be resolved through the daily challenges as many have already pointed out (and resolved). The second kind happens once. Only the first time you have been awarded the Museum. Every time you open the game since then it factions properly, minus the Museum off course which is nowhere to be found. Both kinds happen due to a corrupt save file the moment you close the app while the game is frozen. In same cases the game recognizes that you haven’t been awarded the Museum and tries to give it to you every time you open the app (and freezes again), while in other cases (such as my own) the game recognizes that you have been awarded the Museum and does nothing – no pop up window, no Museum. Im not very optimistic about ever getting that Museum, its been 10 days (in a time-based game). Any suggestions? Just dont tell me to contact EA as their last 3 replies (of 8) were “we need more time, wait for an update”. Im thinking about starting a log..
Its been 10 days since the event hit, there is a lot of planning going on in the brown house but not much else.. its taking them forever to decide the details of the heist.. My Springfield has plenty of museums, a zirconia, a money mountain and a couple of banks.. I don’t understand what on earth they are talking about.. Exactly same predicament I’m in with my game. EA has been worse than useless in attempting to resolve this issue. Now they just automatically close the tickets and follow it up with a “do you still need help from EA…?” email! Really EA? We are paying customers (at least I am. The amount of money I’ve spent on donuts since I started playing this game is truly embarrassing!) not idiots (well maybe, depending on how much you’ve spent on donuts, lol)! Sorry for the rant, but the frustration of A: not getting the museum after 11 days since this bug hit, and B: the inaction of EA to address the problem is leaving me no choice but to stop giving a crap about this game anymore. Well today we (EA help and I) had a breakthrough.. It seems like an April fools joke but its not. They gave me the Museum, they just added it to my account, they couldn’t give me the land token and for compensation they added 20 donuts to my account. They asked me to provide a screenshot that I had completed the task awarding me the Museum & land token and minutes after I did they informed me that the museum is in my inventory. I think that that could have happened days earlier..
Well Im not gonna moan, Im logging in my game and Im gonna try and find my lost enjoyment. I really hope this helps you (as well as anyone else out there still facing the same problem) if you are still missing the Museum.. The planning has finally concluded after 13 days.. They are not going after the new Museum of SFA.. They are going after the casinos.. I am happy to report that the Easter Bunny shat in my town as well today, as the museum was FINALLY placed in my inventory as well! Now I have just over 4 days to do some serious catching up before the first act ends! I unlocked the museum but it’s not in my inventory. 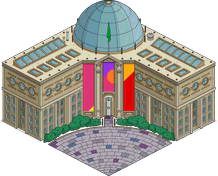 My tapped out freezes when I try to place anything, it won’t let me place the old cathedral or the monorail station. I was unable to get the daily challenges trick to work to unfreeze my game. However, I was able to unfreeze my game by using the tap really quickly in the top left corner trick. As others might have said, when you hit ok on the accept button for the museum, immediately start tapping in the top left corner on the character icons. It took me a few tries and restarts, but I eventually got it. It cleared my character’s task and in doing so put the museum in storage. I immediately went and purchased more land and was able to continue. Now that I’m almost a week behind, a question in my hopes to catch up… If I spend donuts to advance the prize track: Does it simply give me the item? Or does it give me the amount of paintings needed to unlock the item? I’m sure this will be the same as many replies/complaints, but as soon as I start my game it says I’ve just unlocked the museum + free land token. Then whether I press ok or the “back” key on my Samsung, it freezes entirely and I can only close the app. So I can’t even access the game without interacting with the museum and free land, as it comes up as soon as I open the game. I tried reinstalling the game, restarting my phone, and nothing has worked. It’s ridiculous that it’s taken EA so long to fix it; you’d have thought something like this would be a top priority since I’m sure plenty of people put real money into the game (fortunately I’m not one of them).